I recently read George Morris’ new book Unrelenting: The Real Story: Horses, Bright Lights and My Pursuit of Excellence. Mr. Morris warned it would be raw, uncensored, and the real story. He was right. In addition, it was peppered with quotes from those who have worked with him in the past and who know him. It truly shows the real story behind the hunt seat legend, and he leaves no detail uncovered. It took me a while to finish the book. I am actually a quick reader, but I soaked in every detail, wanting to know more about the man most hunt seat equestrians look up to. I found the book engaging, interesting, and like he said, raw and real. I found the book to be inspiring. As I said, one of the most surprising things was that Mr. Morris was a timid rider. I am a timid rider. However, he worked through that and got to where he is today. I also find inspiration in his perfectionism and how he uses it to his advantage, not letting it get to him in a negative way. That is something on which I need to work. Another big thing is the popularity of Thoroughbreds back when he was honing his craft. I never knew this; after all, warmbloods are mostly, if not all, of what I’ve ridden and know. He speaks candidly about the horse world; its weaknesses; America’s weaknesses; Europe’s strengths; and being gay, which I think is hugely important to recognize in the equestrian community. Male riders don’t see a stigma, as far as I know, for being gay, but you don’t see as many female riders coming out. As an avid LGBTQIA+ rights individual, I really appreciated his emphasis, though small, on this aspect of the community. He is truly an inspiration, and I found his book to be motivating. I’ve even given it away twice, and I think anyone serious about riding would benefit from reading this text. It covers a lot of detail, and I learned a lot from it. I also found a lot of quotes that resonated with me, which I will be covering on the blog decade by decade. 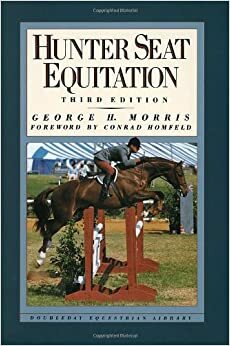 For those of you that have read Hunter Seat Equitation, this book is a lot less technical. There are teachable excerpts and a general focus on technique and riding, but if you are looking to truly learn the correct, recommended way to ride hunt seat, I would encourage you to read the aforementioned book. I encourage you to read both books, in fact. The book is long, but it is well worth it. It tells you all about Mr. Morris’ experiences – horse-related and non-horse-related – and it gives an idea of how things were prior to 2016. My biggest recognitions, as I said, are highlighted above. Overall, the book is well-written, thoughtful, and very thorough – something I greatly appreciated. I also appreciated the quotes from those who have worked with him over the years, though I do think some equestrians were missing (Lillie Keenan, for example). So what are you waiting for? Pick up a copy of this book and crack it open to learn even more than you did before. You won’t regret it. Have you read the book? What do you think? Leave a comment below. I disagree that the book is “well-written.” The writing is atrocious. I’m not a writer or grammarian, but I do know bad writing when I read it. The book is full of exclamation points (I counted as many as four in one paragraph), cliches, incorrect grammar (no understanding of when to use “whom” versus “who”, “vise” versus “vice”, “bad” versus “badly”, no understanding of the meaning of the words hoi polloi or notorious, just to cite a few examples). GHM credits his writer, Karen Robertson Terry, for her “magnificent job.” Poor GHM, he doesn’t know enough to recognize poor writing. I’m 3/4 through the book and have put a yellow sticker on each page with writing errors; I have about two dozen stickers so far. The interviews are interesting, but I find them a bit suspect. Many are written in the same tone, full of exclamation points and adulation. I’m wondering if they are genuine or doctored? Strange that, so far in my reading, there is not one person interviewed who is critical of GHM. Agree to disagree. The book is written in his voice so I find the style to be fitting for him despite its “grammatical incorrectness.” Additionally the book is about GM and his influence on riding, it’s obvious they aren’t going to put critical interviews or descriptions in there. Furthermore, people do describe him as tough, making riders cry, etc. That’s hardly uncritical. Writing is governed by rules, and the rules exist to promote clarity and comprehension. I agree that any direct quote by GHM should be left in his own words, grammatically correct or incorrect. However, the narrative, as in any narrative be it fiction or non-fiction, needs to adhere to the rules of correct writing. This is what distinguishes a well written book from a poorly written book. Karen Robertson Terry does a disservice both to GHM and his readers. Read the book in one day. It read more like notes to be used for an eventual book. None of the stories were really developed; told in detail, had a climax, epiphany, turning point or denouement. No risk taking about the dicey issues; homogenized and whitewashed; a Jacqueline Suzanne story written like a history book; smug and sad.